Trailhead and parking area are on Willard Pond Road in Antrim, NH. Willard Pond Road begins on the northeast side of Rt. 123, 3.3 miles south of its junction with Rt. 9 and 3.7 miles north of its junction with Rt. 137 in the center of Hancock. The parking area is 1.6 miles down Willard Pond Road. Bear left twice to stay on Willard Pond Road. 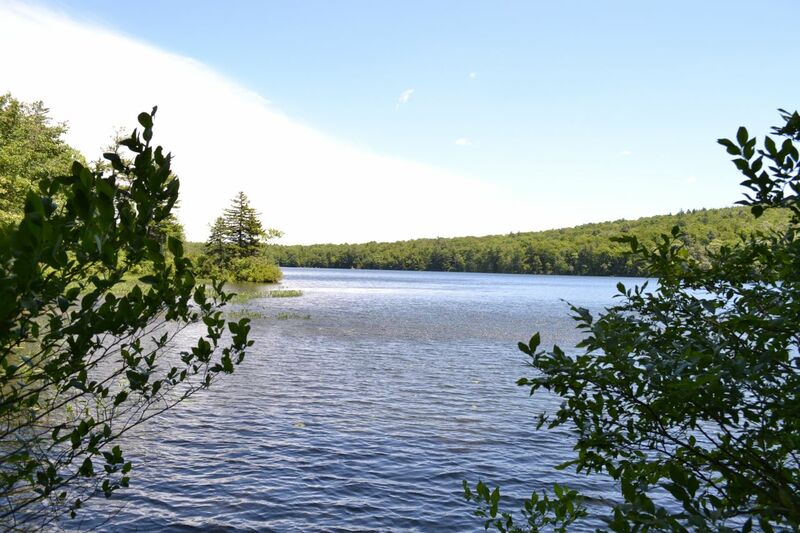 Bald Mountain's ledges, located in Audubon's dePierrefeu-Willard Pond Wildlife Sanctuary, are part of this simple and rewarding afternoon hike. The first part of the trek is on Tamposi Trail, an easy one-mile trail to the top of Bald Mountain. It begins as a winding path through a rock-filled woodland. In 0.5 miles, the trail splits into a loop; bear left at this fork. Soon, the trail steepens to a moderate grade. In 0.3 miles, pass the little-used Spur Trail on the left. Just after that, the trail turns right and ascends to the viewless ledges at the summit of Bald Mountain (reached in another 0.3 miles). To get to the viewpoint ledges, you must descend 0.2 miles on the other side of the summit. The broad ledges provide an expansive southerly view. Notable peaks in view include Mt. Monadnock, Crotched Mountain, and the Uncanoonuc Mountains. You can also see Willard Pond, which you will walk along at the end of the hike. After enjoying the ledges, head another 0.2 miles down the trail to a grassy overlook which provides a closer view of Willard Pond. Just below the clearing, turn left onto Bald Mountain Trail and descend 0.5 miles to Tudor Trail. Turn right to continue along the shore of Willard Pond, passing many good viewpoints over the water. In 0.7 miles, emerge on Willard Pond Road and turn right to walk 0.1 miles back to the parking area.